Fine Arts Chamber Players is pleased to share with you the 2018–2019 season of its free Bancroft Family Concert Series at the Dallas Museum of Art: seven virtuosic programs featuring Dallas’s top professional musicians. The season is bookended by key Dallas Symphony Orchestra (DSO) personnel Alexander Kerr and Nathan Olson, and FACP is honored to have several preeminent members of the DSO, The Dallas Opera Orchestra, and the Fort Worth Symphony Orchestra (FWSO) featured throughout the series – truly a celebration of musical families and FACP’s friends. The season opens with DSO Concertmaster Alexander Kerr joined by DSO pianist Anastasia Markina and closes with DSO Co-Concertmaster Nathan Olson’s Baumer String Quartet. A DSO duo featuring Associate Principal Cello Jolyon Pegis, and DSO violinist Maria Schleuning presents music by Joseph Haydn, Astor Piazzolla, and Zoltán Kodály. Russell Campbell, Associate Principal Trumpet of the DSO, and DSO Principal Harp Emily Levin perform fresh and engaging music in this unusual pairing of instruments whose histories are thousands of years old. The program includes music by Debussy, Gershwin, de Falla, and more. David Buck, Principal Flute of the DSO, and his wife, distinguished flutist Jung-Wan Kang, join DSO pianist Steven Harlos in an afternoon of music for two flutes and piano. Opus Nova, DFW’s newest chamber music ensemble, features husband and wife Artistic Directors: clarinetist Ann Hung and Stanislav Chernyshev, FWSO Principal Clarinet. Presented during Women’s History Month and during the Dallas Museum of Art’s exhibit Berthe Morisot, Woman Impressionist, this concert celebrates the artistic contributions of women. 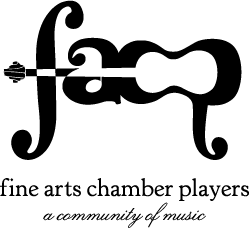 Yong-Ha Jung, viola, winner of the 2018 Lynn Harrell Concerto Competition, a Rising Star recitalist at FACP’s 2017 Basically Beethoven Festival, and music student at The Juilliard School, presents a recital in memory of Dallas native, bassist Charles Barr.